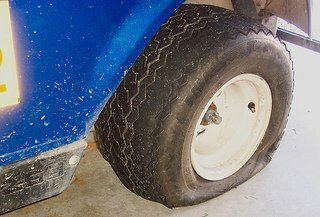 Correct golf cart tire pressure can extend the life of your tires and contribute to even wear of the tire treads. It is important that you maintain the proper air pressure in your golf car tires for a smoother ride in your cart. Tire pressure is important for not only the safety of your cart but also for the life of your tire and for the quality of your ride. You will find the recommended Tire Pressure, or psi (pounds per square inch), on the tire’s sidewall. 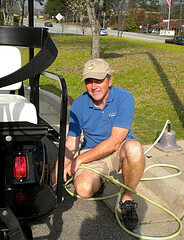 Golf Cart tire pressure varies between each manufacturer and style of the tire. 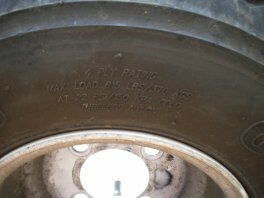 Usually these tires use between 15 to 25 psi, the average is about 20-22 psi. Low air pressure provides a smoother ride because you are getting more traction. However, the sides of your tires will wear faster too. So get your pressure somewhere in the middle. Check for the tires recommended psi or with the manufacturer of your golf cart tires to see what is normally recommended. I own a 1991 Club Car Manual and it suggests an 18 psi for my model cart. Higher pressure or overfull tires make the ride stiffer and the middle of your tires will wear faster. In overfull tires the sides of the tires make little or no contact with the ground, the cart has less traction and compromises the safety of the ride. Just ask my daughter and son-in-law. He was over-inflating his tires to around 50 psi. When I asked him, "WHY???" he stated it was because he lost air in the tires. Well, he won't do it any more. Here is a picture of his overinflated tire that is worth a thousand words. One afternoon, while my daughter was in the house, and thankfully no one was on the golf cart or in the garage, the tire exploded with such force that it blew out the rear light of the cart. 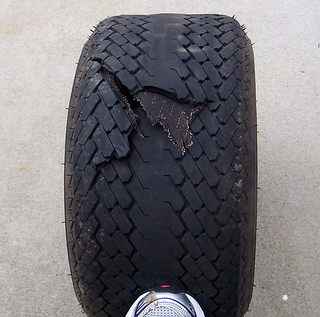 "A tire explosion can cause severe injury or death. Never exceed inflation pressure rating on tire sidewall." I happened to be over at the house shortly after it happened, and after a brief discussion of what the normal tire pressure should be, my son in law quickly deflated the rest of the tires. They can't believe what a difference it has made in how the cart rides. My daughter said what used to be a rough, jarring and bouncy ride is now smooth and enjoyable. 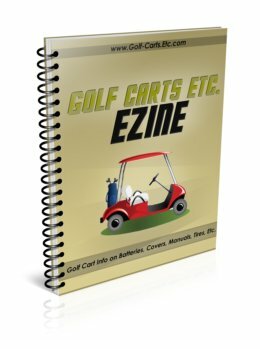 You may find that one of your golf cart tires has developed a leak and has gone flat. Luckily this tire went flat in my son-in-law's garage. He inflated it and then brought it up to a local auto shop to have the leak checked. If they can find the leak it and it is small it can be plugged. Unfortunately, he needed a new tire. When replacing just one tire, you want to try to match the tread design so that the replaced tire looks just the other 3. Attach the hose on the can to the tire valve, turn the can upside down and press the button. The tire will inflate and sometimes actually seal the puncture. Fix-A-Flat S60269 Aerosol Tire Inflator with Eco-Friendly Formula, 24 oz. Check your tires for even wear of the tread. 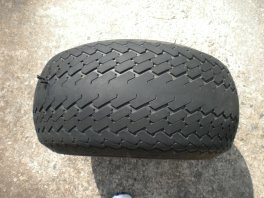 See how there is hardly any tread left in the middle of the tire in this overinflated golf cart tire? The smooth, almost treadless (is that a word?) area in the middle means that the correct tire pressure of this tire has not been maintained. Tires that are under inflated means that the outer tread has too much contact with the road and will wear prematurely. It's not just the tires that are affected by low pressure but the performance of the golf cart as well. The batteries and the motor have to work harder, and the golf cart is unable to perform optimally. You may notice that it has less power or speed. Maintaining proper golf cart tire pressure in your cart will help extend the life of your tires and give you a better and safer ride. If it's time to replace your tires check out Amazon where you can get really get a good deal on golf cart tires.